Why Did Jonah Run Away? Hard to Say or Hard to Do? David's Son is His Lord? Did you know that the Hebrew Scriptures have some very important things to say about the nature of the Gospel? The Gospel is not a New Testament concept, even though it is mentioned quite often in the New Testament. 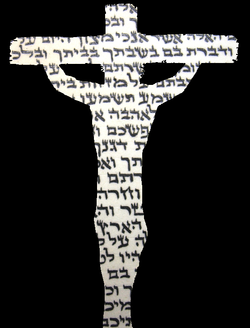 The actual concept of “Gospel,” which means “Good Message,” is found rooted in the Hebrew text - the Tanakh (The Torah "Law," the Nevi'im "Prophets," and the Ketuvim "Writings"), and cannot be separated from the foundational truths with which it was sown without very real damage being done to the message of the Messiah. Unfortunately, it has suffered in the hands of those who, either ignorantly or by choice, have attempted to cut it off from the Word in which it is so vitally rooted. This is a tragedy, and it is important to do whatever must needs be done to rectify the situation. The New Testament even has our beloved brother Paul, in Galatians 1:8-9, pronounce a curse upon anyone who is preaching a Gospel that is different than the legitimate Scriptural teaching based originally in the Hebrew Scriptures and made fully known in the accounts of the initial ministry of Yeshua the Messiah. The concepts that make up the Gospel are thus vital for us to correctly understand. Therefore, what you will find below are the five passages in the Tanakh - the Hebrew Scriptures - that speak explicitly of the Gospel, in effort to let the reader see the fuller intent of what the Messiah has purposed to do in this earth for mankind. 10 Behold, the Master YHWH with strength shall come, and His arm shall rule for Him! Behold, His reward is with Him, and His wages are before His face. 11 As a Shepherd His flock He shall feed; in His arm He shall gather the lambs, and in His bosom shall carry them; the sucklings He shall guide. 12 Who has measured waters in the hollow of His hand, and the heavens with a span estimated, and calculated with a measurement the dust of the earth, and weighed in a scale the mountains, and the hills in a balance? 3 And I have not learned wisdom, nor knowledge of the Holy Ones do I know. 4 Who raised up to the heavens, and descended? Who gathered the wind in His palms? Who compressed waters in his cloak? Who established all the extremities of the earth? What is His Name, and what is His Son’s Name, if you know? You can see the link between verse 12 of Isaiah 40 and the questions from Proverbs, which bring up the notion of the hidden identity of the Son!! Verse 3 even says “Holy Ones,” not “Holy” or “Holy One,” as is commonly translated somewhat misleadingly. The Hebrew there is QADOSHEEM, which is plural, instead of QADOSH, which is the singular for “Holy.” So the initial statement is that the writer of the proverb does not have an understanding of the Holy Ones, and he goes on to even ask the Name of the Creator and His Son! Therefore, when Isaiah gives his prophetic utterance and asks such questions as these in Proverbs, he is pointing us to the fact that the Redeemer, the Good News Bringer He mentions, is none other than the Son Himself!! What we can understand from the first mention of the Gospel explicitly in Scripture is that it is speaking concerning the Divinely-wrought nature of the Messiah. He has the authority to be the Redeemer because He comes directly from the authority and will of the Holy One of Israel. 26 Who has declared from the beginning, that we should know? And formerly, that we should say, “He is righteous!” So too, there is none that declares; also none that listens; also none hearing Your Words. 27 A beginning is for Zion: “Behold! Behold them! And to Jerusalem I shall give the Good News Bringer! 28 And I looked, and there was no man, and among them, and there was no advisor, that when I questioned them, returned a word. 29 Behold! They are all useless! Their deeds are nothing! Wind and emptiness are their molded images! 42:1 Behold My Servant, I uphold Him; My Chosen One, in whom My soul delights! I shall give My Spirit upon Him; justice to the Gentiles He shall bring forth! 2 He shall not cry out, nor lift up, and neither shall He make His voice heard in the street. 3 A crushed reed He shall not break, and dimming flax He shall not extinguish; truthfully He shall bring forth justice! This second appearance of the Gospel in the Tanakh focuses very strongly on the nature of the righteousness of the Redeemer. The absolute uselessness of the people is made known; no help or support could come from the tainted line of Adam. It is through the Chosen Servant of Yah that justice comes to the earth. His is not a ministry of the flesh; no flashy catch phrases or prideful calling of attention to Himself was necessary for the Messiah – He only had to teach the Word of hope to those who would listen, and He did not despise those who were broken and scarred from weathering the world. Instead, people hung on His every word because they could see pure instruction. In this respect, they waited for His Torah – His Law. It is the power of Yah that sustained Yeshua and allowed Him to accomplish all that He did; He is truly the covenant itself! The New Covenant is His blood, and the soul is in the blood, so Scripture says, and Messiah Himself said His blood was the blood of the New Covenant. That means that HE HIMSELF is the covenant!! This all goes back to His righteousness, for in His veins did not run the tainted blood of Adam, and because of this, He possessed a living, abiding righteousness. It is this reason that He could be the Chosen One whom the Holy One could not find among all other men. Thus, the second mention of the Gospel in the Hebrew Scriptures shows us the inherent and necessary righteousness of the Redeemer of men. 4 For thus says the Master YHWH, “My people went down to Egypt at first, to sojourn there; and the Assyrian pointlessly oppressed them. 5 And now, what do I have here?” says YHWH, “For My people are taken away gratuitously! Those ruling cause them to howl,” says YHWH, “and continually every day My Name is blasphemed! This third declaration of the Gospel is all about the redemptive purpose of Yeshua. Verse 3 speaks of being sold for nothing, that is, giving one’s self away. That is what happened in the Garden to Adam. He willingly let go of his rights. He gave it all away. The notion of redemption is brought forth in verse 4 by referencing Egypt and Assyria – both nations who held Israel captive. The result of such captivity is oppression to the point of His Name being blasphemed, which He will not abide. And thus, the Gospel-Person is promised again, in order to bring “salvation” to Zion. “Salvation” literally means “rescue.” He tells them, “Behold Me!” In the garden prayer of the Messiah to the Holy One in John 17:6, He explicitly says that He has revealed His Father’s Name to His disciples, that is, made known to them the true character of Yah – the Father who wants His estranged children to come home. All of this was to secure the salvation of men. 1 The Spirit of the Master YHWH is upon Me, on account that YHWH has anointed Me for the Good News unto the meek, and sent Me to tie up those with shattered hearts, to proclaim to the captives liberty, and to the prisoners certain liberation. 2 To proclaim the favorable year of YHWH, and the day of vengeance for our Elohim, for the comfort of all the mourners. 3 To appoint for the mourners of Zion, to give to them beautiful headdresses instead of ashes, the oil of joy instead of mourning, the mantle of praise instead of the dimming spirit, and call them trees of righteousness, the planting of YHWH, for His beautification. 4 And they shall build the ancient desolate places, the former ruins they shall raise, and they shall restore the desolate cities, the ruins of generations and generations. 5 And strangers, they shall stand and shepherd your flocks, and the sons of the foreigner shall be your plowmen, and your vinedressers. 6 And you shall be called ‘Priests of YHWH;’ ‘Ministers of our Elohim,’ shall be said of you; the strength of the Gentiles you shall consume, and in their glory you shall boast! The fourth appearance of the Gospel concept in the Tanakh focuses on the immediate results of the ministry of the Messiah. The rescue procured for us by Yeshua brought about immediate and promised realities. The immediate realities are mentioned in this passage: the healing and deliverance and restoration of our lives are things so swiftly realized and set into motion for those who have been bought by His blood. Righteousness before Yah, and an express purpose in life of continuing the restoration process in others, are things that each believer shares in the bountiful life of spiritual gifts and callings. The Gospel restores what was lost, heals what is wounded, and makes a future where there was none. Yeshua’s work of redemption has brought men more than what Adam lost in the beginning. So the fourth description of the Gospel in the Hebrew Scriptures teaches about the efficacy of redemption in the lives of His people now. Behold upon the mountains the feet of the Good News Bringer, who makes peace heard! Observe your festivals, Judah! Complete your vows! For no more shall pass through you Belial – he is entirely cut off!! This fifth and last expression of the Gospel is the only one found outside of the book of Isaiah. In the book of Nahum, whose name means “Comfort,” we read this wonderful declaration of true comfort. We are told to observe the festivals of YHWH, to perform the vows we make, knowing that peace and comfort have come, because Belial (literally meaning “the Wicked One” and a title for Satan) is cut off from ever affecting us again! What a wonderful truth to be told, and is the real culmination of our faith; peace and freedom from all temptation and oppression! The performance of the festivals of the Holy One, while at first possibly a strange addition to the Gospel message, is actually entirely relevant, because the seven Scriptural festivals of Most High are prophetic portraits of the ministry of the Messiah, and thus lay forth for us the plan of salvation so beautifully. Therefore, He tells us to replay that plan over and over, to think upon it in our actions when we do it, just as Messiah said of Passover, that it should be done in remembrance of Him. This final declaration of the Gospel in the Tanakh is a perfect close to the pre-Yeshua Gospel presentation, for it shows us all what hope we have to look forward to in Him. We have not yet seen the day when Belial is utterly cut off, but it will come, and true comfort and peace will be ours in that hour! Thus, the fifth mention of the Gospel is all about our future hope for peace and our eternal remembrance of the plan of salvation secured for us by Yeshua’s act of worship and deliverance. The Gospel, therefore, is rooted deeply in the Hebrew Scriptures, and contains the essential truths that we see branching out so beautifully in the New Testament about our Messiah: His Divinely-authorized nature, His unique righteousness, the redemptive purpose, His gifts of healing and restoration, and our final future of freedom from all evil. This is the essence of the Gospel. The roots vivify the lush canopy of the New Covenant and let us appreciate and view the Message correctly, as He intended it to be understood. It truly is a good message! From beginning to end, from deepest root to highest branch, the Word is unified in its message, that we who hear might be united with our Creator! All study contents Copyright Jeremy Chance Springfield, except for graphics and images, which are Copyright their respective creators.